Chandigarh (Punjab) [India], May 12 : Union Home Minister Rajnath Singh on Friday said that students and youth of Kashmir wherever they are in the country should be treated nicely and decently and provided comfortable environment. Rajnath said this while attending the Northern Zonal Council meeting here on Friday. He advised all the Chief Ministers, ministers and chief secretaries in this regard. He stressed that all the youth of India from Kashmir to Kanyakumari are our own children and should be treated accordingly. 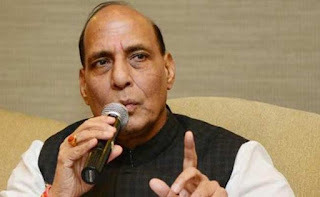 The 28th meeting of the Northern Zonal Council consisted of the states of Haryana, Himachal Pradesh, Jammu and Kashmir, Punjab, Rajasthan, National Capital Territory of Delhi and Union Territory of Chandigarh under the chairmanship of Rajnath. The meeting was attended by the Chief Ministers of Haryana and Punjab, Administrator of Union Territory of Chandigarh, Lieutenant Governor of Union Territory of Delhi, Deputy Chief Minister of Jammu and Kashmir, Ministers of Haryana, Himachal Pradesh, Jammu and Kashmir, Punjab, Rajasthan, Delhi as well as the senior officers from Central and state Governments. The deliberations of the Council were warm and cordial in the true spirit of cooperative federalism and ended with the decision to host the next meeting in Rajasthan. The Zonal Council discussed and deliberated upon 18 items of common interest among the member states. The major items discussed were 'Need for fiscal and infrastructural harmony in Northern States, Joint efforts for export of fruits, flowers and vegetables from the states, sharing of water of various rivers of the region and also hydropower among states, controlling pollution in the region by setting up Common Effluent Treatment Plants and Treatment, Storage and Disposal Facility (TSDF) for disposal of hazardous waste, contamination of water in canals of Rajasthan off-taking from Harike Barrage and setting up of mini hydel projects on Bhakra Main Line Canal at 27 Sites with total 63.75 MW of power in Punjab. Out of the 18 items discussed today, seven were resolved in the meeting. There are interstate problem of effluents generated from industrial areas as well as from sewage from towns draining in River Yamuna and Ghaggar as well as canals of Rajasthan. In a major step forward all the member states unanimously agreed to jointly tackle the problem of water pollution under the guidance of Central Pollution Control Board. For export promotion of fruits, flowers and vegetables APEDA has sanctioned projects to Jammu and Kashmir, Himachal Pradesh, Punjab and Rajasthan. The states were urged to try to settle the contentious matters of sharing water and hydropower amicably through the mediation of the concerned Union Ministries of Water Resources and Power. This will help harnessing potential hydel power at very low cost. The five Zonal Councils were set up under the States Reorganization Act, 1956 to foster Inter-state cooperation and coordination among the states. They are mandated to discuss and make recommendations on any matter as a cooperative endeavour for states linked with each other economically, politically and culturally. Being compact high level bodies, they are capable of focusing attention on specific issues taking into account regional factors, while keeping national perspective in view. The present Central Government revitalized the zonal councils. Nine meetings of various zonal councils and 11 meetings of their Standing Committees have been held since 2015. Overall 699 issues were discussed in these meetings and 345 have been resolved.